Preschoolers always have learning in mind. Following two unrelated directions, such as "Put your toy on the table and get your coat on." Understanding the order of daily routines such as breakfast first, then lunch and finally dinner. Four-year-olds have a growing attention span and will finish activities more independently than before. They enjoy singing, rhyme and nonsense words and will play with language with a growing sense of humor. Five-year-olds know more than 3,000 words and enjoy creating and telling stories, as well as remembering and retelling stories. They recognize more complex categories and comparative terms. They understand concepts such as more, less and same and opposite terms such as before/after and above/below. Five-year-olds understand many principles of books and stories: they know that stories have a beginning, middle and end and understand that a book is read from left to right, top to bottom. Five-year-olds begin to understand the difference between fact and fiction. They have a good attention span and can concentrate well. Five-year-olds are interested in reason and cause and effect and are capable of elaborate creative and dramatic play. 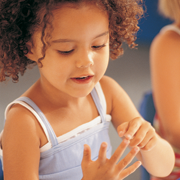 Preschool children are building on earlier experiences and incorporating new ones. They are eager to explore many ideas that will be taught in greater detail in school. Concepts such as time, seasons, counting, the alphabet and spatial relationships intrigue four and five-year-olds as they actively explore old toys and ideas in new ways. There is no need to rush or pressure your preschooler into academic learning. Preschoolers are not emotionally or cognitively prepared for heavy doses of formal education. A good approach is to offer your child a wide range of learning opportunities. Trips to the zoo, children's museums - and of course - the library are great ways to expose your child to new experiences and ideas. Your preschooler will likely have lots of questions and be curious about many things. Books from the library are a great way to help answer preschoolers' questions. Non-fiction books for young children cover a wide array of topics from bears and boats to xylophones and X-rays. Young children are capable of listening to and understanding stories and non-fiction books written at higher reading levels. Don't hesitate to read books that seem a little "too old" for your preschooler. Encourage and expand your preschooler's talents and interests through books.